Decide where you want your message. I put it along the bottom hem on the leg, but not too close to the bottom or it would be hard to use a hoop. The bottom of the words were 1½ inches from the bottom of the hem. And I placed it in the middle of the front right side. Your message can written in your handwriting or printed using any font. My font was Anjelika Rose which can be downloaded from www.1001fonts.com. You can copy a double or single heart from my Heart and Double Hearts Patterns, make your own, use another symbol, or none at all. Adjust the heart to the size you want. For my name I used my actual signature. But I had to redraw it a little so that there would be plenty of space between every line (considering that it will be sewn over with thick thread). If the lines are too close together you won’t be able to read it once it’s sewn. 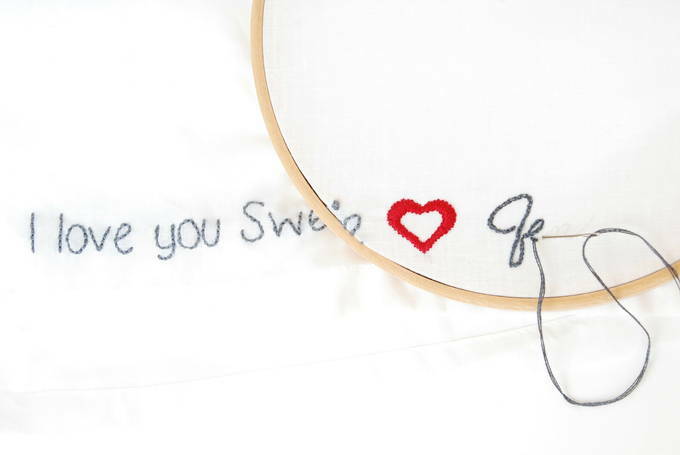 Put the message, heart, and your signature under the fabric and trace it using a pencil or fabric marker. If using a dark fabric you’ll have to draw them by hand. Put your fabric inside the hoop so it is taut. If your message is along the bottom hem like mine, be sure to use the bottom of the hoop. You want as much material stretched across the hoop as possible. I finished my thread after each word but you can use one continuous thread. The darker the thread the more it will show through a light colored fabric. I drew a little arrow route plan on my pattern to show how I was going to sew it. You want the shortest connection to the next letter. To make the stitches, follow my Embroidery Stitches (Back, Split, and Satin) – Directions. I used the back stitch on the message with 4 strands of floss and the split stitch on my name with 3 strands of floss. These are small words so they need small stitches to go around curves smoothly. The double heart was made using the split then satin directions with three strands of floss for both kinds of stitches. Remove hoop and iron or steam fabric. If you used a fabric marker, follow it’s instructions to remove it.